I was rather restrained over the Christmas period, with the combined fun of being on-call at work and spending most of my time asleep getting in the way of the drinkathon that normally accompanies the time. However, I did get to try a bunch of boozes and rather than go into my normally excessive levels of detail I thought I’d slip back into my old Quick Tastings post style, something that I seem to have forgotten to do in recent times. 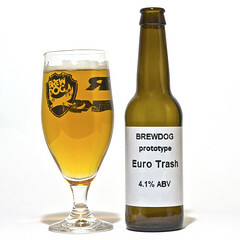 BrewDog Eurotrash: picked up at the same time as my recent lot of Punk X, this is one of BrewDog’s prototypes that I hope appears more widely. It had the traditional BrewDog muddy hoppiness on the nose, but with an underlying sweetness that I wasn’t expecting. To taste it had a nice chunk of hops but was very much more a fully flavoured continental style beer – hints of Leffe and other big malty golden beers from the other side of the channel. It wasn’t quite as big as those beers, but was nicely balanced between hop bitterness and malty sweetness – one I’d like to get some more of. 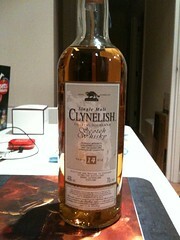 Clynelish 14 Year Old – picked up from Waitrose as my Christmas whisky this didn’t get much of a look-in on the day itself, although it has become my new favourite hipflask whisky now that I’ve run out of Longrow Cask Strength (which I need to find some more of). As is usual at Christmas it was sillily priced at £25 (I also picked up some The Glenlivet 18 and Aberlour A’bunadh batch 31 a few days later for similar prices – no more whisky buying for me for now) and is definitely worth more than that. On the nose it has the traditional Clynelish waxiness, with brine, sweaty boiled sweets, creamy vanilla, leather and a touch of meaty smoke – my note says ‘burning beef?’. To taste it’s initially sweet turning to sour wood by the finish. There’s vanilla, mint, menthol and sour sugar to start, and unripe red grapes and tannic wood to finish. Water adds more sweet and sour fruit to the start as well as a prickle of white pepper. Again, my slightly drunken notes add ‘more lemony if you burp’. I’m pleased with this bottle and it’s on my list of things that I should always have in the house. 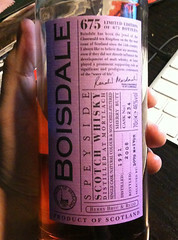 Boisdales Mortlach – this is one I tried after the The Glenlivet tasting with Caskstrength, which I found to be rather pleasant. On a random wander into The Vintage House I saw a row of bottles of it hiding in their rather excellent independent bottlings selection and for £37 couldn’t really say no. On further inspection I noticed a familiar name on the back of the bottle – Berry Brothers and Rudd’s Doug McIvor, as they selected and bottled this for Boisdales. It’s the colour of golden syrup and the nose continues that feel with salted caramels backed up with a hint of smoke, shiny polished wood and lemons. To taste it has a big sweet caramel with raisins, cinnamon and allspice, balanced by unripe grapes and wood polish. The finish is short with sour wood and a hint of smoke. Water doesn’t change much, bringing out a little more sweetness and lengthening the finish. Easy drinking and very tasty, I suspect some more of this maybe sitting at the back of my cupboard soon waiting for next Christmas. 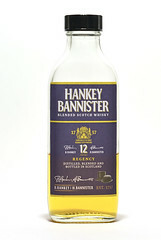 Hankey Bannister 12 Year Old – part of a Christmas care parcel from Lucasz over at the Edinburgh Whisky blog on behalf of Inver House. This is part of a range of blended whiskies that are now distributed by Inver House, although not all that easy to find in the UK, that stretch back to 1757, when Hankey Bannister & Co was founded in London to provide drinks to the locals. The 12 year old is the second in their range, with their Original sitting beneath it and 21 and 40 year olds above it. I’ve had a look and can’t find it easily available on the web in the UK (although TWE have the 40 year old available for £360 per bottle…), but it pops up abroad and in duty free from time to time. On the nose the 12 year old had acetone, pear drops, muddy smoke, apples, vanilla and a underlying meatiness. To taste it was quite delicate, starting with a quick burst of pine and moving through tannic dryness to fruity sweetness and a light creaminess. The finish was quite light and long with sweet wood and digestive biscuits. Water didn’t reduce the flavour very much and brought out more red fruit fruitiness and creaminess. It has the nose of a blend and is easy to drink like a blend but doesn’t have a heavy graininess like you get with some blends. Not stunning, but not bad. anCnoc 16 Year old – anCnoc (with crazy capitalisation) is the brand name that is now being used by the Knockdhu distillery, also owned by Inver House, to distinguish it from similarly named Knockando. On the nose it has pink foam shrimps, refreshers and vanilla, with a slightly sweaty salty note behind the sweetness. To taste it was astringently woody with fizzy sherbert and woody vanilla leading to a sugary woody finish. It could take a good chunk of water bringing out sour Skittles, more creamy vanilla and a big sweet and sour fruitiness. I wasn’t a fan of this neat, but water brought out the some balancing sweet and sour fruit that I rather liked. Anyways, welcome to the new year and here’s to twelve months of interesting imbibing. Many thanks to Lucas and Inver House for my Christmas parcel. There were also a couple of Old Pulteney samples, but as I’ve written about those before and there’s a Twitter tasting coming up soon I’ve left them to one side for now. Prototype golden ale/blonde beer, 4.1%. Not generally available. 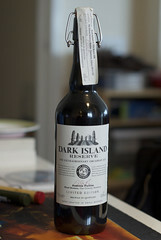 Orcadian dark ale, 10%. Not generally available.